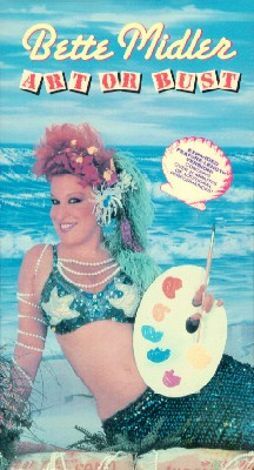 Anyone offended by the 82-minute concert tape Bette Midler: Art or Bust knew what they were in for when they saw the videocassette dust jacket: a shot of La Bette dressed in a hilariously hideous mermaid costume. The highlight of this collection of scenes from Midler's live presentations is a lengthy clip from her touring show. We also see a sampling of Midler's last bathhouse show before she went "mainstream." Though the tape is very raunchy at times, Midler's seemingly limitless talents as a performer should transcend all tongue-clucking for her more prudish fans (does she have any prudish fans left?). Art or Bust can't hope to match the exuberance of a live Bette Midler concert, but it certainly tries its best.